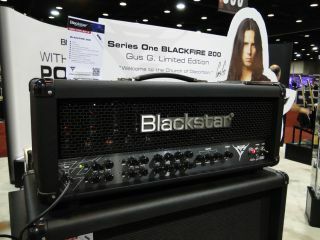 Blackstar has its first-ever signature amp head with the Gus G Blackfire 200. Built around the firm's KT88-equipped Series One S1-200 model, the amp features custom-voiced 'Fire' and 'Fury' overdrive channels, as featured on Gus G's signature HT Blackfire pedal. We met up with Blackstar's marketing and artist liason manager Joel Richardson who gave us the rundown, and then guitarist Freddie DeMarco cranked up the amp and let 'er rip. Check out the press release for full specs on the Blackstar Gus G Blackfire 200.